I hope everyone had a great Thanksgiving break and meal. I stayed in Chicago hanging out with friends and family, and of course eating too much. It's time to get back to work and write about all the good (and sometimes not so good) food. Long before Thanksgiving Erica and I made a stop into the new Pei Wei Asian Diner. It's located right off of Elston near the Target shopping center. Jed (having grown up in AZ), had heard of Pei Wei, but we mid-westerners had no idea. Pei Wei is a P.F. Chang's China Bistro concept. The description from the website is - Pei Wei Asian Diner (pronounced pay way) is a chain of quick-casual restaurants that serve freshly prepared, wok-seared, contemporary pan-Asian cuisine in a relaxed, warm environment with friendly attentive counter service and take-out flexibility. As soon as I entered it reminded me of a California Pizza Kitchen. Menus were on large LCD screens right when you walk in, you order at a counter and then receive a number to place at a table of your choosing. Drinks are self serve (and they have one of the new cool Coke machines - worthy a visit in of itself). Enjoy this special culinary day with friends and family. I was invited (read: offered free food to try) to Lillie's Q to photograph and taste some new items that will (or have) appear on a winter menu. This was an exciting opportunity because Lillie's is my favorite new BBQ spot to invade Chicago amongst many rivals (read my previous experience). Even though I did not pay for my food this time, my opinion of the high quality and tasty food coming out of the kitchen is unchanged. The various BBQ sauce options on the table are reasons alone to keep returning. The four items we tried were hush puppies, grilled pimento cheese, hot-links and collard greens. A new “For The Table” appetizer. Homemade corn batter is mixed with scallions and pimentos, then formed into balls, and finally deep-fried. The light and crispy hush puppies are served with a homemade sweet potato dressing for dipping. There are nine hush puppies in each order, and each order costs $5. Erica is more the expert on all things cornmeal and bread and she gave two thumbs up. I liked the sweet potato dipping sauce, though it could have used a bit more kick and it was a little to runny for my taste. When in doubt, reach for the BBQ sauce and life is grand (I can put good BBQ sauce on anything). The presentation is great, a silver cafeteria tray with a small cast iron dish and glass jar. Erica and I made a quick stop to meet a friend for a bite last weekend in New York. We picked 'wichcraft since it was Friday and Ross was still working (in the Rockefeller Center). The story behind 'wichcraft is as follows: Tom Colicchio, chef and owner of the Craft family of restaurants and head judge of Bravo’s Top Chef, founded ’wichcraft with partners Sisha Ortuzar and Jeffrey Zurofsky in 2003. The three had a long history of working together in fine dining restaurants such as Manhattan’s top-rated Gramercy Tavern and Craft, but this collaboration was decidedly more casual. They created ’wichcraft, a sandwich service like no other. It was a perfect spot for a mid-day sandwich. 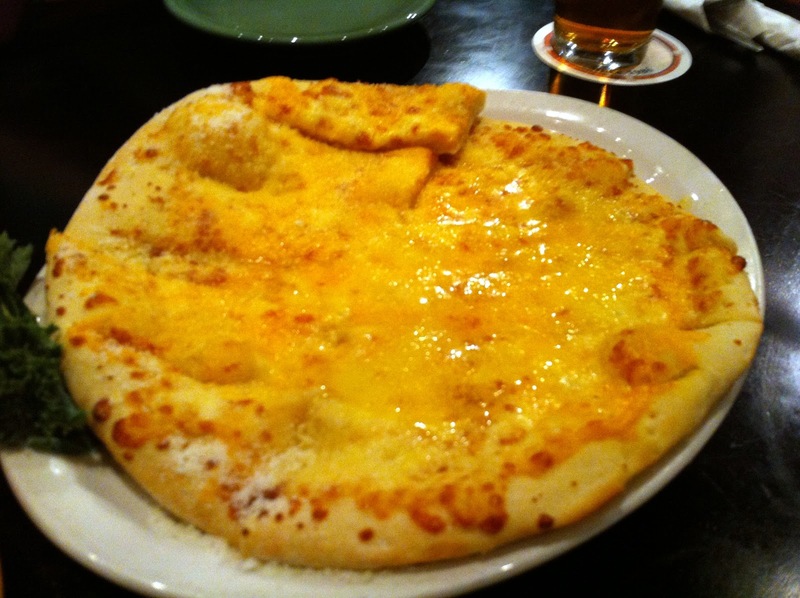 Both Erica and I were in the mood for a melted cheese sandwich, especially considering the chilly conditions outside. 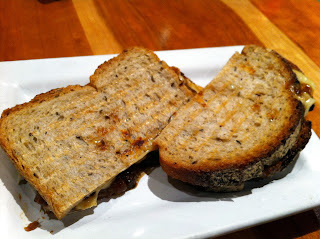 My choice was the grilled gruyère with caramelized onions on rye bread. It was simple and good, as expected but not cheap either ( $6). I have not been very good at living up to my blog title recently. If I like to eat, why have I only posted twice in three weeks? There is no good answer besides life gets busy when you least expect it to. Fortunately last week I made time to have a good meal with the gang at the latest Q spot in town. We all enjoyed our meal in a fun and different BBQ environment, though felt dissapointed given the hype and awards advertised. I thought the sauces were very tasty, especially the spicy. But the meat was as expected, not amazing and not terrible. I'm always interested in trying BBQ, one of my favorite foods, and Chicago q presents a unique approach. Located in the heart of the Gold Coast, q is not a BBQ shack but an upscale restaurant. I appreciate the change of pace eating BBQ and there's definitely an opening in the market for such a concept. The interior is well done, with lots of whites, wood, and an interesting upstairs area in the middle of the floor. The bar area in the front reminds me of other Chicago steak-houses (think Morton's), before entering the main venue. The most interesting detail is a very large (20 X 30 feet ish) back lit picture of a car on a road (in the south presumably). Our service was very good throughout the evening, though the one blemish was the strange introduction. Since this was our first visit we were given the entire story, which felt like a sales pitch about how wonderful Chef Lee Ann Whippen was at cooking and the awards won. Maybe it's overly critical, but imagine sitting down at Alinea, for example, and being told how many awards it's won or how special Grant is. It should either be assumed that we know the headlines on the chef, or let the food speak for itself. Street food, Koren BBQ, food trucks, take your pick. These are all the rage right now in the food world. Chicago has been keeping up, and the addition of Del Seoul only enhances our position. 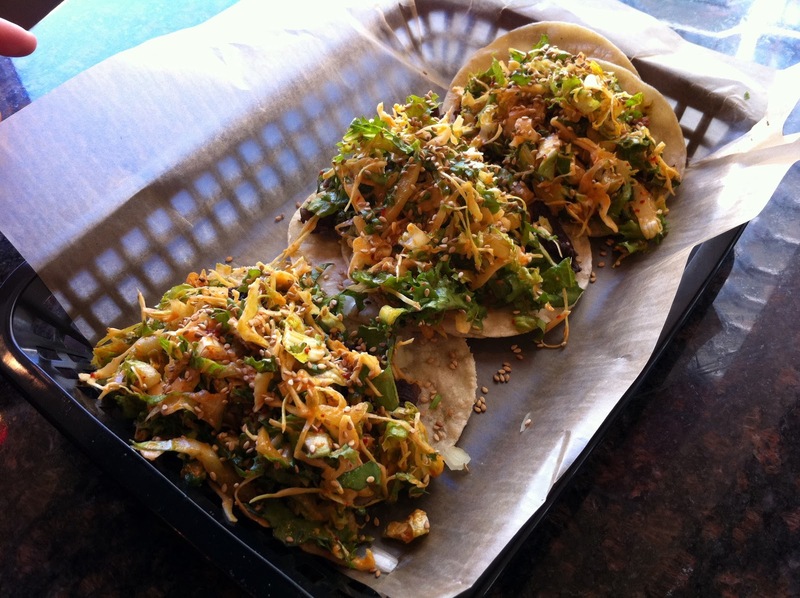 The inspiration of Del Seoul "comes from the Korean “street foods” of California, Asia and Korea." Their "goal is simple: to put a modern, unique spin on Korean food." Erica and I went for a walk for lunch today and discovered that Del Seoul succeeds with flying colors. Located on the busy section of Clark St at Wrightwood, the space is a simple but well done store front. The menus are on LED screens above the counter, and after ordering the food is brought to your table. I really enjoyed the food and flavors at Del Seoul. The menu is small and straightforward, but with enough options. The main decision is Korean BBQ Tacos or Korean BBQ "Banh Mi" Sandwiches. There are also a few specialty and side items. Luckily we ordered a little of everything to try as much as possible. I ordered a spicy BBQ pork and the Kalbi (grilled beef short rib) taco. Erica went with a Kalbi taco and Seoul style street dumplings, and we added a side of fries. I loved my tacos and would order them again in a heartbeat. The meat was well seasoned but the marinade and sauce stole the show. All tacos are served with a cilantro-onion relish, chili-garlic "salsa", and a secret slaw. Taking all the flavors together I would not be surprised to see Korean tacos become a new favorite. Even though the look small, only two or three are needed for a full meal.